The Top 10 Las Vegas hotels on and off the Strip. Save your money for the tables -- or at least, for the buffet tables. You can stay in a cheap hotel in Las Vegas for less than $100 per night. 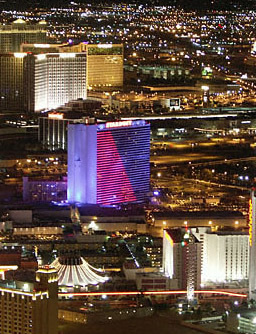 Look for a bargain on this list of cheap Las Vegas hotels. Las Vegas is more about glitzy hotels than hip hotels. But there are a few plasma screens and pool scenes to be found.